KENNEDY SPACE CENTER, FL – In a potentially major change in direction for NASA’s human spaceflight architecture, the agency is officially studying the possibility of adding a crew of astronauts to the first flight of the Orion deep space crew capsule and the heavy lift Space Launch System (SLS) rocket currently in development, announced Acting NASA Administrator Robert Lightfoot. Lightfoot made the announcement in a speech to the Space Launch System/Orion Suppliers Conference in Washington, D.C. as well as an agency wide memo circulated to NASA employees on Wednesday, Feb. 15. The move, if implemented, for the first joint SLS/Orion flight on Exploration Mission-1 (EM-1) would advance the date for sending American astronauts back to the Moon by several years – from the next decade into this decade. Lightfoot has directed Bill Gerstenmaier, associate administrator for the Human Exploration and Operations Mission Directorate, to start detailed studies of what it would take to host astronauts inside the Orion EM-1 crew capsule. “I have asked Bill Gerstenmaier to initiate a study to assess the feasibility of adding a crew to Exploration Mission-1, the first integrated flight of SLS and Orion,” Lightfoot said. 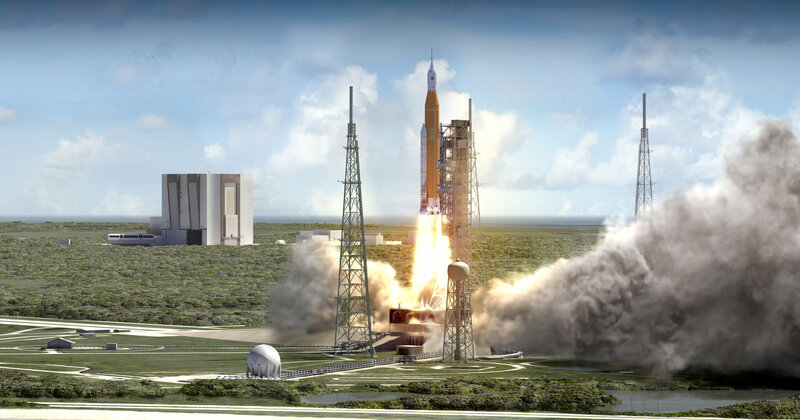 NASA’s current plans call for the unmanned blastoff of Orion EM-1 on the SLS-1 rocket later next year on the first test flight – roughly in the September to November timeframe from Launch Complex 39B at the Kennedy Space Center. “The study will examine the opportunities it could present to accelerate the effort of the first crewed flight and what it would take to accomplish that first step of pushing humans farther into space,” NASA officials added in a statement. But because of all the extra work required to upgrade a host of systems for both Orion and SLS for humans ahead of schedule, liftoff of that inaugural mission would have to slip by at least a year or more. “I know the challenges associated with such a proposition, like reviewing the technical feasibility, additional resources needed, and clearly the extra work would require a different launch date” Lighfoot elaborated. The Orion EM-1 capsule is currently being manufactured at the Kennedy Space Center. Now it might actually include humans. NASA has flown astronauts on first flights of new rocket systems in the past.. the shuttle. The STS stack uses proven technology and the Orion capsule has successfully flown.. so it shouldn’t be a worry… Or should it? Instead of launching humans on the first flight of this new stack, how about launching a robotic mission to one of the outer planets instead? Push the system to the limit to see if it deserves a man rated grade? Hmm.. that’s my vote anyway. Similar to the first Saturn V launch in 1967, NASA underestimated the amount of noise and vibration produced by the Shuttle. Shock waves from the SRB thrust were deflected up into the orbiter’s tail section, which could have caused structural or other damage. An improved water suppressant system was later installed in LC 39A to dampen vibrations. Pilot Crippen reported that, throughout the first stage of the launch up to SRB separation, he saw “white stuff” coming off the External Tank and splattering the windows, which was probably the white paint covering the ET’s thermal foam. The astronauts’ on-orbit visual inspection showed significant damage to the thermal protection tiles on the OMS/RCS pods at the orbiter’s aft end, and John Young reported that two tiles on the nose looked like someone had taken “big bites out of them.” Classified cameras at a United States Air Force satellite tracking station in Hawaii took high-resolution photographs of the shuttle in orbit, and NASA concluded that the damage didn’t constitute a “major problem.” Post-flight inspection of Columbia confirmed that approximately 16 undensified tiles near the OMS pod had been lost during ascent. Columbia’s aerodynamics at high Mach numbers during reentry were found to differ significantly in some respects from those estimated in pre-flight testing. A misprediction of the location of the center of pressure (due to using an ideal gas model instead of a real gas model) caused the computer to have to extend the body flap by sixteen degrees rather than the expected eight or nine, and side-slip during the first bank reversal maneuver was twice as high as predicted. The orbiter’s heat shield was damaged when an overpressure wave from the solid rocket booster caused a forward RCS oxidizer strut to fail. The same overpressure wave also forced the shuttle’s “body flap” – an extension on the orbiter’s underbelly that helps to control pitch during reentry – into an angle well beyond the point where cracking or rupture of its hydraulic system would have been expected. Such damage would have made a controlled descent impossible, with John Young later admitting that had the crew known about this, they would have flown the shuttle up to a safe altitude and ejected, causing Columbia to have been lost on the first flight. The strike plate next to the forward latch of Columbia’s external tank door was melted and distorted due to excess heat exposure during reentry. This heat was attributed to an improperly installed tile adjacent to the plate. Despite these problems, the STS-1 mission was completed successfully, and in most respects Columbia performed optimally. After some modifications to the shuttle and to the launch and re-entry procedures, Columbia flew the next four Shuttle missions. Next PostNext What is the Weather like on Saturn?